Gather insightful feedback about your camp staff’s performance. 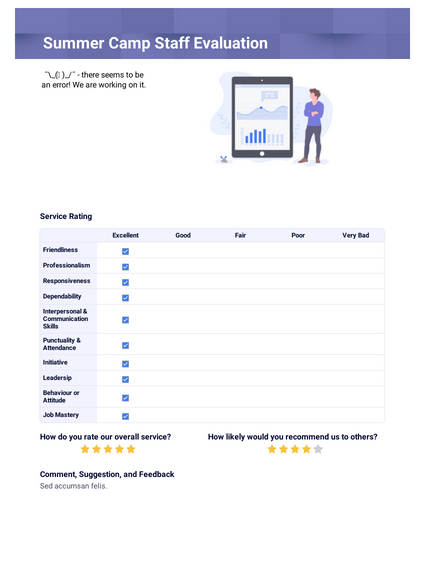 This Camp Counselor Evaluation PDF Template will convert all evaluation submissions into PDFs you can easily download, print, and share with the counselor being evaluated. Using our intuitive PDF Editor, you can modify the template design to match your existing evaluation form. Rewrite the provided text for criteria, include additional questions, and change the rating scale system. With counselor evaluations saved as easily-accessible PDFs, your camp staff can work toward making next year’s program even more memorable. ¯\_(ツ)_/¯ - there seems to be an error! We are working on it. How likely would you recommend us to others?